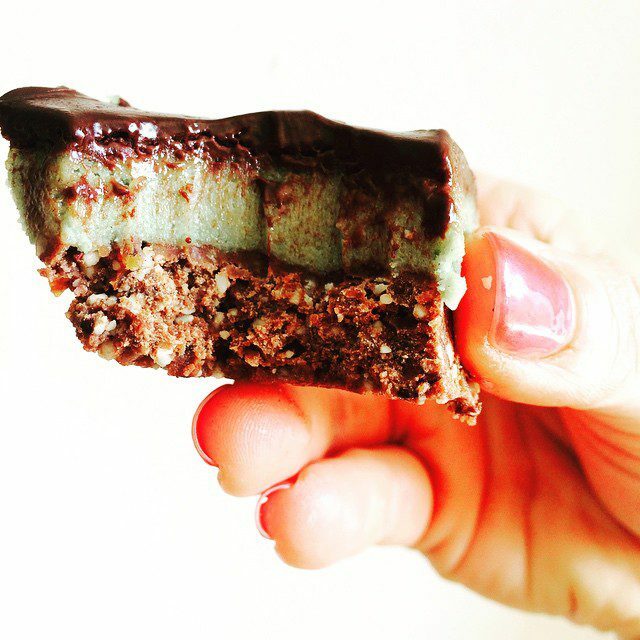 Deliciously minty slice with a chocolate ballBag base and a hint of PondWater. Vegan, gluten free, no processed sugars or unnatural ingredients, so it’s healthy right? Mix melted coconut oil with the BallBag mix. Press into a slice tray. Pop into freezer for quick setting. Place pre-soaked cashews, melted coconut oil, coconut nectar, Pondwater and mint essence into a blender. Blend on high, adding water slowly. Continue until a smooth consistency. Pop back into freezer for quick setting. Melt coconut oil, add coconut nectar and cacao. Pour over mint filling layer. 15mins and you will be ready to slice and enjoy! Brought to you by Kimberley and Luke, Burleigh Heads Farmers Markets.